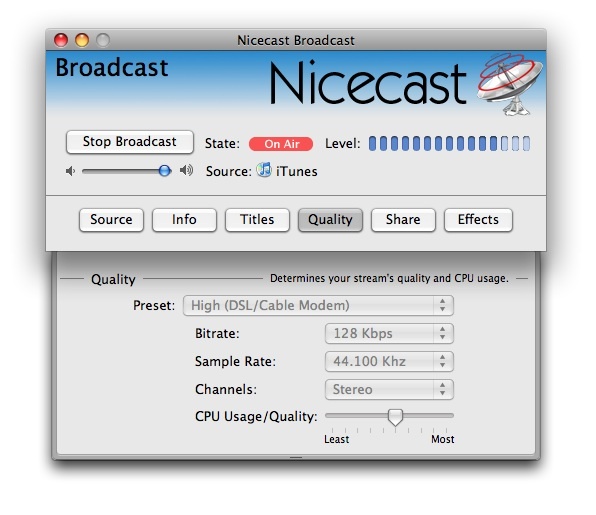 Nicecast 1.10.10 – Create an Internet radio station on your Mac. The Instant On component has been updated to version 7.2, with improvements in latency and other fixes. The Application Source selector has been improved to better show which apps can be captured. Capturing audio from applications which are pulling from audio devices should now have much lower latency. An issue where Safari audio capture could fail on non-English systems has been fixed. Support for audio capture from the Citrix GoToMeeting VoIP app has been improved. Track titles are no longer erroneously sent when the broadcast if Off Air. That was dumb. The NSURLConnection log will no longer inundate the Console with needless noise. That was also dumb. A potential crash-at-quit bug has been fixed. But really, if there's one time you might not mind an app crashing, it's when you're quitting it. Errors that previously could appear when capturing from Megaseg no longer appear. That's nice. A crash that could occur when transmitting to Shoutcast with the Nicecast debug logging on has been fixed. The license window now correctly shows long license keys. We disabled erroneous editing in the mailing list window. ARE YOU HAPPY NOW, RANDOM INTERNET COMMENTER?! Sorry, sorry, got a bit carried away there. Several other small bugs and crashes have been fixed. Next story Disk Diet 5.0.2 – Get more free space for your SSD or any drive with one simple click. Previous story Audio Hijack Pro 2.10.10 – Record and enhance audio from any application. Fission 2.4.0 – Streamlined audio editor. Any FLAC Converter 3.8.23 – FLAC to MP3/ALAC/WAV.